Buff'd Cosmetics is Turning 10! October 5, 2015 will be Buff'd Cosmetics' 10 Year Anniversary. What better way to celebrate than to have a giveaway! 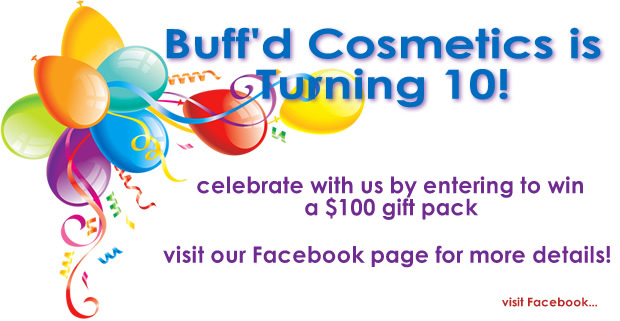 We will be giving away a $100.00 CDN Buff'd Cosmetics prize package to one lucky winner. Included in this package will be a foundation along with blush, bronzer, eye shadows and lip glosses all specifically matched to work well with the winners skin tone! Deadline for entry is Sunday, October 4 at 9:00 pm PST. The winner will be picked by random and posted on our timeline on Monday, October 5, 2015.